To begin, I should say that this isn't the most interesting article. Although it's real in the sense that I've given some thought to the content, I'm publishing this to get a feel for the process rather than because I think other's will find it useful or because I think it describes a finished project. At home I have an ADSL Internet connection, which works perfectly well most of the time. However, sometimes, the connection dies and the modem reconnects automatically. Occasionally, perhaps once or twice a month, the connection dies and the modem doesn't reconnect. I tried replacing the ADSL modem without success, so presumably there's a problem at the exchange or with the line. However, trying to get that fixed sounds like a lot of effort given the sporadic nature of the problem. After all, power-cycling the modem fixes the problem. On the other hand, it's pretty irritating to reset things manually, especially if I'm not at home when the connection dies. Inspired by a recent tutorial at OSCON1, I realized that it would be sensible to automate the process. Essentially it's simple: if the link has hung then just cycle the power to the modem. A simple Perl program is enough to test the link. Rather than checking that the link is alive directly, we'll just try to fetch the Google homepage. After all, people sometimes say that if something's not on Google then it might as well not exist. We're going to assume that if we can't reach Google then the link might as well not exist. Obviously we'll shortly replace the reset_modem() subroutine with something which talks to the hardware. Cycling the power is easy, the only tricky part is that the modem is some distance away from the computers. One could run extra cables, but there's a perfectly good network in place which ought to be able to carry an extra bit of data: though to do this one would need a network enabled microcontroller. Happily Microchip2 make it relatively easy to connect a PIC microcontroller3 to ethernet, and a company called Olimex4 sell a PIC Mini Web5 with all the necessary components on it for about 25 pounds (US $50). You can see a picture of the Mini Web below. To get an idea of the scale, the large box-like connector on the left is an ethernet socket. 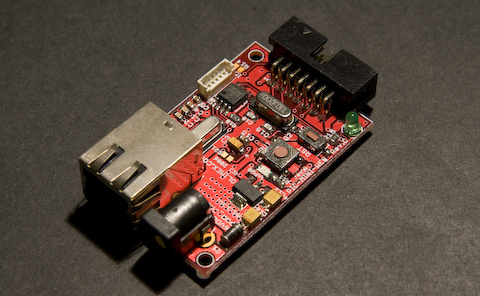 A 1Mbit flash chip which is used to store files for the web and FTP servers. 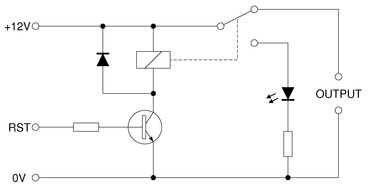 When RST goes high, the transistor turns on, so current flows through the relay coil. In turn that causes the switch to move, turning on the LED and turning off the modem. The board is hard-wired to use 192.168.0.30. In principle this can be changed by sending a GET request, which tweaks some non-volatile registers. In practice I found it easier to just hack the software to use a hard-coded address. Although the software has loads of functionality, as supplied it's won't let you wiggle random I/O lines up and down. Of course it's simple to add this. The software is written in C, and so needs a compiler. For Window's users Microchip provide a free demo/student edition of their commercial compiler, but this is crippled: after 60 days some of the code size optimizations are disable and the full application no longer fits in the PIC's memory. Happily a simple HTTP over TCP server does still seem to fit, but extraneous stuff e.g. UDP and FTP support need to be removed. For this particular project it's highly desirable that we can make the PIC pulse the relevant output line rather than sending one command to turn the modem off and another to reset it. Actually it's essential because the communication between the PC running the software and the Mini Web actually goes through the ADSL modem's internal hub. Some sort of interrupt driven solution is probably the 'right' way to handle a long (~ seconds) delay, but I took the quick-and-dirty approach and just executed a delay loop. The Mini Web might well be unresponsive during the delay, but the modem's dead and so nobody can talk to it anyway. # we won't see the HTTP reply! Having generated a new application file, it needs to be programmed into the Mini Web. 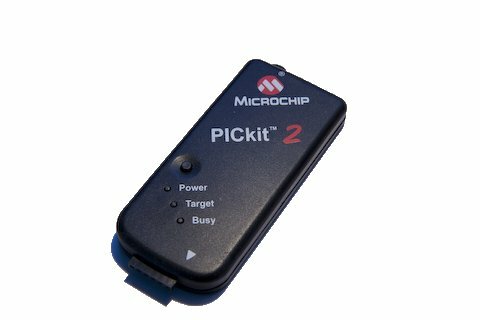 I used Microchip's PICkit 27, an inexpensive programmer which connects to the PC over USB. It comes with Windows software, but you can also drive it from Linux or MacOS. You'll need to make a cable to connect the mini-ICSP connector on the Mini Web to the 0.1" header on the PICkit2, or you could buy one from SparkFun8 at least I think that should work. Generalize the firmware so it can be used to control or monitor many things without modification. In other words, make the MiniWeb into a simple IO device, leaving the control logic to run on a distant PC. Specialize the firmware to include the code which polls the link status, so that the Perl script (and the associated PC) isn't needed. On the other hand, for all its problems the software does actually do a useful job! Perhaps the right message to take away from this, is that devices like the Mini Web make it easy to use Ethernet as a control network. Revised by Martin Oldfield on 05 Jun 2013, original version 11 Nov 2007.